A simple and a delicious kurma. Wash and chop the carrots and potatoes. Pressure cook the carrots, potatoes and peas. Allow it for 1 whistle. Heat oil in a pan. Add the seasoning ingredients. Add the chopped onions and when they turn translucent add the ginger- garlic paste.Saute them well. Add the chopped tomatoes along with the turmeric powder , coriander powder and chilli powder. Cook them well till the oil comes out. Add the cooked vegetables with sufficient water and salt. Mix them gently. Add the cahew nut powder at this stage. 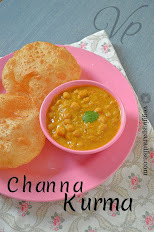 Serve it hot with Dosa's, Puri's and Chapathi's. super carror kuuma, kids likes much. Oh...I would like to try this! Can share some, please! 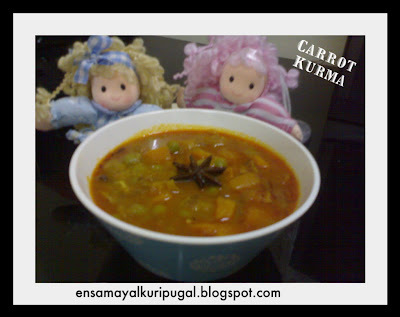 Delicious carrot kurma and tempting.. This seems to be a very healthy food which I would prepare very soon by using your recipe for my son . Just hoping he likes it as well. Looks delicious and I love the cute little dolls in the background. Pretty presentation Aruna! Kurma sounds very nice! I like the way you did to the photo. The bowl of soup with the dolls. Great! 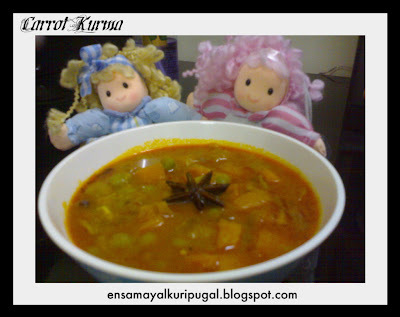 I need some dosas with this kurma love the color and the idea of carrot in kurma!!! Looks delectable!!! Came here looking for carrot recipes. You have a lovely space.